Today I got up at 7, early for a Sunday. It was just me and the birds! I took a shower so my hair would dry in time for Mass -- well, so it almost would, anyway. Then, alas and alack, I worked on my book about Leonard Pennario. I could not help it! I could not stay away from it. And I always get mad at myself when I work on it before Mass because Mass is such a mind-bending thing that you really should use the time beforehand to clear your head. Sure enough, after Communion, there I was, thinking about the book. I think I prayed for about 10 seconds and after that, I realized to my horror that all I was doing kneeling there was going over in my mind how I should try to get a hold of Van Cliburn, should I call him, or should I write to him? If I write to him I will be ignored. I wrote to him once before and I never heard back. But then maybe that was because I enclosed this little note with the clips of my story about him that he had wanted. Maybe he did not see the note. Maybe it fell on the floor and the maid swept it up. I have been to Van Cliburn's home and I know how grand it is and I would bet that Van Cliburn has maids to clean up notes that fall out of envelopes journalists are sending him. I have Van Cliburn's phone number because I interviewed him for The Buffalo News -- funny, it was just a couple of weeks before I met Pennario. The phone was giving me problems and I asked Mr. Cliburn if I could call him back on my other phone and he said sure and gave me the number. I also have his number from Pennario's address book. Every pianist in the world, his or her number is in Pennario's address book. But I do not like to call someone like Van Cliburn out of the blue. Well, I will just have to. After I write to him one more time and he does not call me back. I want to talk to him about Pennario being on the jury of the Van Cliburn Competition. And about the Tchaikovsky Competition and a conversation Pennario had with Cliburn about that before Cliburn entered it and won it. That is a funny story. Cliburn is nice and I am sure he would not mind talking about this. Maybe I should just call. No, maybe it's more proper to write. Most people I would just call but some people require special protocol and I do not like calling anyone out of the blue, really truly. Calling that girl Pennario was in love with when he was in his 20s, that was no picnic, working up to that call. See? That is how it goes. That was me after Communion. Kneeling there thinking about Van Cliburn. Yay, me! Great going, you know? 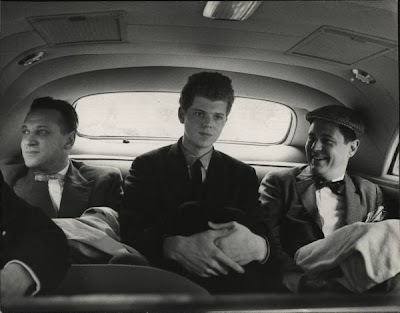 Here is a snazzy picture of Cliburn from Life Magazine. Look at those hands. Zounds! 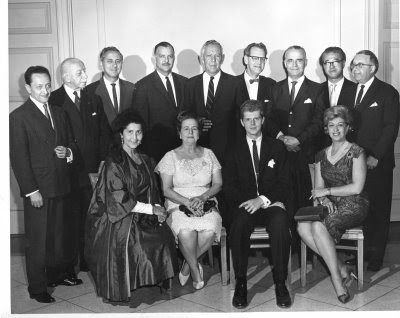 Here is a historic picture of the jury from the first Van Cliburn International Piano Competition. Pennario is the good-looking one. Darn, I am looking and looking for this picture I have of Howard hanging out with Van Cliburn at the Rue Franklin downtown. And I cannot find it. That was fun, listening to Cliburn play at the Rue, even if all he had to play on was that little spinet. Perhaps next time he can play at Big Blue! I thought about that after Communion too. I do not think I came out of my reverie until the priest finally went, "Benedicat vos omnipotens Deus..." which means "May Almighty God bless you" and signals the end of the Mass. I was such a loser! But even so I rewarded myself afterward with a stop at the Hertel Market. That is the Hertel Market pictured at the top of this post. It is all spiffed up for summer! I bought a big pot of pink and purple flowers. And a pineapple. And walnuts and almonds. I am having that kind of a day. I enjoyed your post. Good luck with the book!